You are a divine being, a sacred woman. You adorn yourself more and more as you come to know how sacred you are. For you are made of the same stuff as the stars and Light, as the earth and the oceans, as thunder and lightning. You are that energy, that Light, that Love, that preciousness that walks upon the earth. For you are a goddess. All that remains is for you to know yourself as one. Here are 7 ways to adorn yourself with your sacredness. 1. Seek and find what makes you vibrate with sacredness. Find your joy, where you feel that this, this, is who you are on a deep core level. Whether it’s sitting in church, on your meditation seat, swimming with dolphins, growing an orchard, or gathering with friends. Create and make time to touch that sacredness. 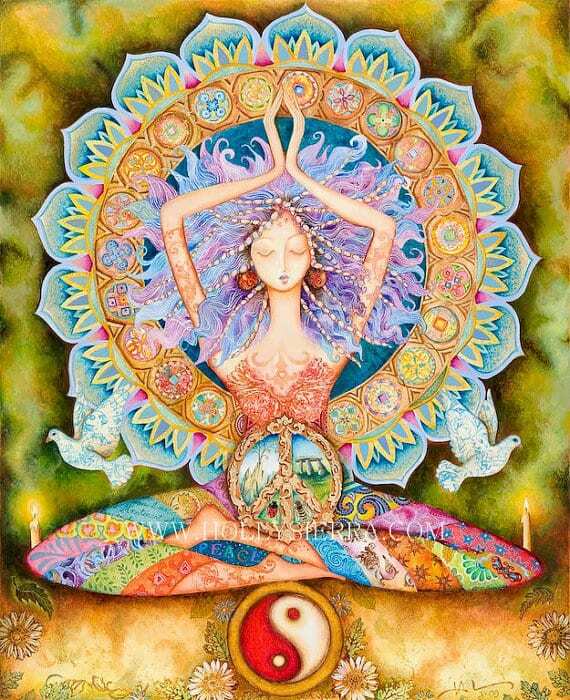 Enter, breathe in, and nourish yourself with that sacred energy. Touch your presence, your essence, your spiritual matter. It doesn’t have to “look spiritual”. For everything is spiritual if you feel it to be so. Drink deep from these depths. Open to the mystery and awe of your being. Of just being. Of knowing and not knowing. For there are illuminations, gifts, intuitions, guidance, and revelations to be found here. A few moments of this, even a faint glimpse in a half hour of meditation, can alter and shift the texture of your life. Whether you call it Spirit or Krishna, God, Mother, the Universe or Essence, it is all you. For whatever it is that makes a lion roar, a whale spout, a star flicker across years of traveling light, you as you create your day, love and are loved, grow and , it is all you. If you are thirsty for it, call out to it so you may know it more. Whatever depth or touch of the sacred you experience, know that that is you. Your sacredness doesn’t live outside of you, in some distant heaven on some distant throne. It throbs in your heart. You journey with your soul. The touches and flickers and enveloping descents of Grace and Peace and Love and Joy are you knowing your true nature. Your sacred experiences tell you, remind you who you are. This, this is your sacred face. This, this, is your sacred body. This, this, is your sacred self. Gather up your divinity within you, around you. Hold it as the altar in your heart. And so walk, step by step, day by day, upon the earth. You are both sacred and a channel for sacredness. When you connect with your sacred Presence, with Spirit, it flows through you. It touches and sanctifies and transforms your life, your loves and your challenges. You touch and connect with the sacredness around you—your garden, your terrier or kitten, wild leopards of Africa, daffodils in spring, people in and not in your life, the bumblebees and hummingbirds. Know who you are. Really are. Know great Joy, Grace, Peace, Love, and Beauty.